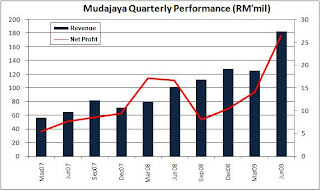 Mudajaya had a really good run-up for the past 3 months, rising from a mere RM1.50 in mid-July to current level of RM3.65, with its stocks transforming into a rather active trading counter from an illiquid and cold one. Mudajaya also starts to make into media's headlines which bodes well for its stocks as more investors realize the growth prospects of this company. I believe there will still be upside to the stock as the recent run-up hasn't fully justify the strong fundamentals and strong growth prospects that this company could offer. Further price triggers include stronger quarterly results (to be announced end Nov'09), projects awards and financial closures for its IPP projects. In addition, further roll-out of big ticket items such as LRT projects, LCCT terminal, double tracking (Gemas-JB), Pahang Selangor Water Transfer etc. could trigger further upward rerating for construction stocks. From being a small-mid construction company, Mudajaya is slowly transforming itself into the likes of YTL with businesses in construction, properties, concrete manufacturing and trading of building materials while it is also venturing into IPP (Independent Power Producer) projects in India. Bulk of its earnings come from construction, marginally supported by other business segments. Huge orderbook: Mudajaya's gigantic outstanding orderbook of RM5.4bn even exceeds the big boys' orderbook like IJM and WCT. Out of the RM5.4bn, 60% comes from its EP (Engineering & Procurement) works for its IPP projects in India while the remaining ones are local construction projects. On top of that, Mudajaya has submitted tenders worth a total of RM1.7bn, of which RM800mil is from Malaysia, RM500mil from Saudi Arabia and RM400mil from India. The Company might secure RM600mil from 2-3 project bids locally, potentially bringing its orderbook past RM6bil mark by end-2009. Margins from these new project bids will be favorable as they are negotiated ones with pretax margins potentially reaching mid-to-high teens. Power play: Mudajaya has made a really good move going into India's power production. In view of India's negative reserve margin and huge power supply shortage coupled with India's tariff rates which could go up from 17 sen/KWh to 50 sen/KWh (Tenaga is 23-38 sen/KWh), Mudajaya stands to benefit from lucrative recurring income with the commencement of IPPs by 2011. In addition, Mudajaya is the only Malaysian contractor recognised by India's National Thermal Power Corporation (NTPC) which could mean less competition in project bids. Owing to India's economic expansion, the Indian government has set a target to increase its power generation by 78,000MW by 2012. Mudajaya's 1,440MW is only a small fraction of the power needs in India. Therefore, more construction of power plants are expected in the pipeline, which could land Mudajaya with more IPP projects. Earnings: Earnings for the past few quarters were impressive, recording q-o-q increase since Sept 2008, owing to IPPs projects and high margin projects kicking into higher gear. Quarterly net profits rose to above RM25mil mark as compared to historical average of RM10-15mil a year earlier. With most of its orderbook slated to complete by 2012 (RM5.4bil), assuming no replenishment of orderbook which is highly unlikely, revenue has to reach RM1.8bil p.a. 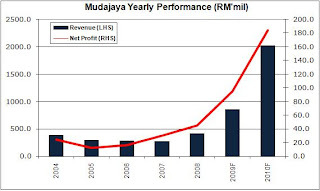 in FY2010-12, a massive increase from its revenue of RM422.4mil in 2008 and estimated RM1bil in 2009. Quarterly net margins have been in the range of low-mid teens, thus for conservative sake, we'll assume 10% net margin which could translate into net profit of RM180mil, equivalent of 48.2 sen per share. Note that this earnings forecast has not taken into account potential recurring income coming from its IPPs.